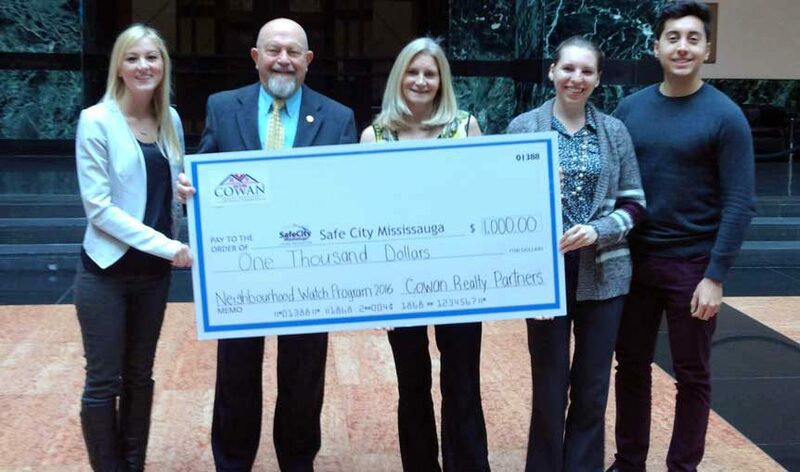 MISSISSAUGA, ON – On April 13, 2016, Cowan Realty Partners generously sponsored Safe City Mississauga’s Neighbourhood Watch program, joining the program as a first-time sponsor. Proceeds from the $1000.00 sponsorship will go towards program delivery, ensuring that the Neighbourhood Watch Program can continue to expand and meet the needs of citizens across the city. Neighbourhood Watch increases community safety by helping neighbours protect themselves, their families, and their property. We provide neighbourhoods with signage, a Crime Prevention Through Environmental Design (CPTED) audit, a joint meeting and presentation with Safe City Mississauga and Peel Regional Police, and window decals to deter criminals. Nearly all studies show that Neighbourhood Watch areas are associated with lower levels of crime, and research conducted by a third-party evaluator, shows that Safe City Mississauga’s Neighbourhood Watch Program is effective at reducing property crime by 61%. Safe City Mississauga applies Crime Prevention Through Environmental Design (CPTED) principles to the watches. This evidence-based approach focuses on changing the man-made environment to make it difficult or unappealing for would-be offenders to commit a crime, and can reduce property crime by up to 80%.